You will be likely to find recyclable scrap metal items throughout nearly every room in your house. However, the room that tends to contain the most metal items is the kitchen. Are you in the process of cleaning out or renovating your kitchen? Do you have any old scrap metal items to dispose of? If so, you might want to consider recycling them. Wondering which metal kitchen items can be recycled in River Grove? Read on to find out! Perhaps you’re getting rid of an old pair of tongs? Maybe you have a metal spatula that’s seen better days? While you could just throw your old utensils in the trash can, another choice is to have them recycled. By recycling these items, you will not only be helping the environment, but you’ll also receive a bit of money to do so. Swapping out your old forks, knives, and spoons in favor of a new set of silverware? If so, you really should think about recycling them. While steel silverware won’t yield a huge monetary return, it will still provide you with some extra cash. Plus, as always, your submission will make a difference in the world by helping the environment. You’re almost sure to have some soup cans stored away in your kitchen pantry. If so, you shouldn’t just throw them in the trash. Instead, you should recycle them. Made out of steel and lined with tin, these cans are commonly recycled. While they won’t yield a huge monetary return alone, they can yield a decent return if submitted in bulk. Like soup cans, soda cans are recycled on a regular basis. Because they’re used to package a variety of liquids, you almost certainly have some sitting in your kitchen at the present moment. When the time comes to dispose of them, instead of throwing them in the trash, you can bring them to a metal recycling facility. Have you just recently installed a new oven range? Wondering what to do with the old one? If so, you should definitely consider recycling it. Oven ranges contain a great deal of metal and will generally yield a fairly high monetary return. If you’re going to bring an oven range to your local scrap metal recycling facility, you should think about removing some of its components first. Often times, the individual components in a range can be scrapped for more money than the entire range if it were intact. Microwaves seem to come and go faster than all other kitchen appliances. Because of this, it wouldn’t be far-fetched to assume that you have an old one sitting around in your house. If you do, you should think about recycling it. Looking to dispose of some of your old pots and pans? If so, you might be able to recycle them. While scrap metal recycling facilities are sometimes unable to recycling coated pots and pans (coatings can interfere with the integrity of the recycling process), they will always accept non-coated pots and pans. Do you have scrap metal items that you’re hoping to recycle? 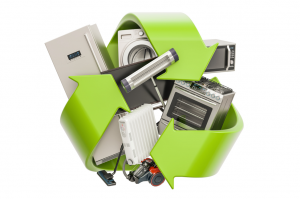 Looking to recycle these items in the River Grove area? If so, Central Metal Recycling is the recycling center to call. Our facility accepts all types of scrap metal items, including stainless steel items, copper items, brass items, and more. Regardless of the type and amount of scrap metal you plan on submitting to our facility, you will be rewarded with a cash payment.